Houdini 6, the Top Chess Engine Champion is now available in the Chessdom shop. 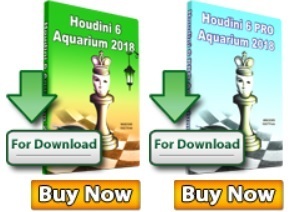 The Houdini 6 Aquarium version includes 8 a revolutionary analysis, database and chess publishing tool, combined with the world’s strongest chess playing engine, Houdini 6 UCI. Orders are processed within 12h of the purchase. With both products we will add for free one year of 7-men Lomonosov tablebases online support.